There are moments when you walk into a restaurant and need to stop, breathe, breathe again, and then continue your walk. Those moments sometimes arise when you you step into a restaurant and feel an overwhelming sense of peace and tranquility. That moment was Benjarong at the Dust Thani in Abu Dhabi. "Sawadee ka": You are greeted warmly in Thai fashion at the door and shown to your table. Typical Thai traditional music in the background threatens immediately to arrest your thoughts and carry you back to your previous visits to Thailand. For such is the power of those steps to my table that I feel I am in as authentic a Thai restaurant as I could hope to be. I am given the menu, and I vacantly take it. The host goes through the formalities, but my mind is not there. I am taken in by the beauty of the restaurant. However, I am brought back to Abu Dhabi when I am offered a warm damp hand towel to freshen up - I wipe my hands and face and think how therapeutic it is. Lemongrass imbues the air. I put down the towel and peruse the menu. 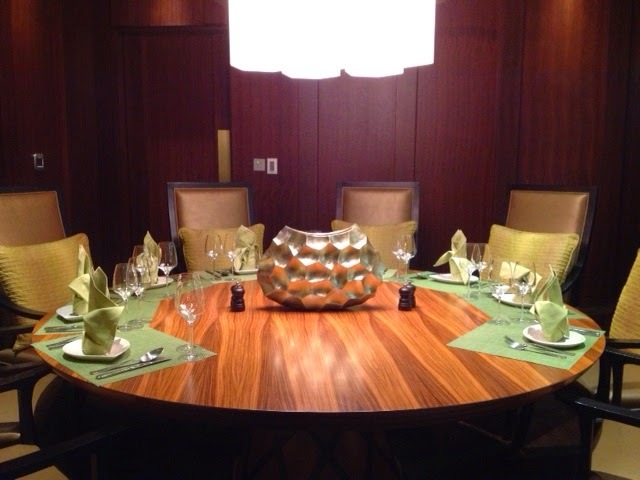 Dining solo, meant I did not use this semi private room. I love the attention detail. Still, I am distracted. 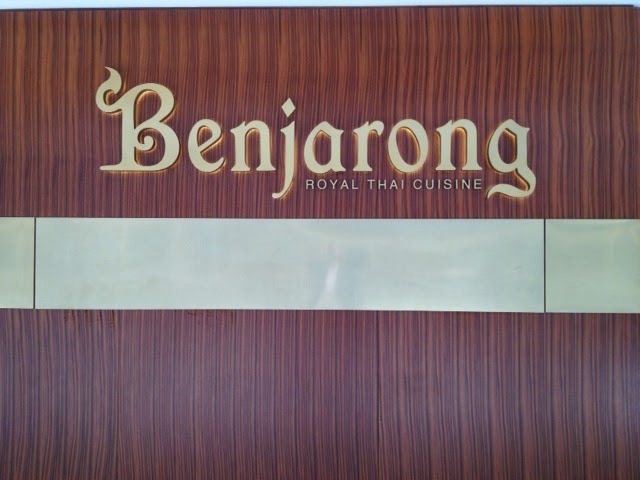 I put down the menu, and walk around Benjarong. I notice the intimacy of the restaurant. The restaurant accommodates 48 diners in various seating arrangements, with a private but open dining area an absolute highlight. 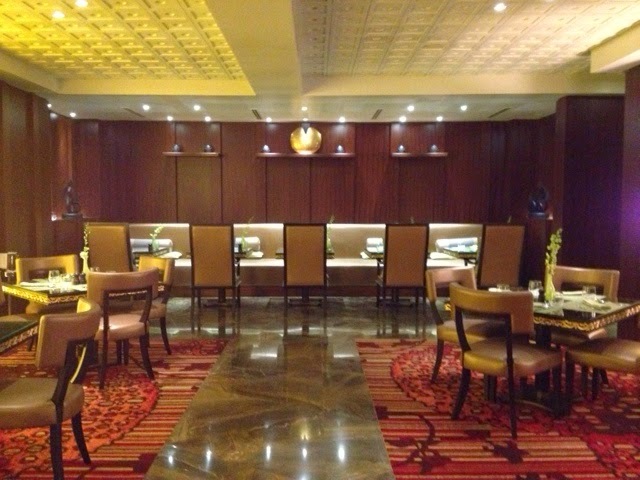 The bar, yes there is a bar, accommodates a further 21. Yet, you never feel that your privacy is compromised with tables nicely spaced out. 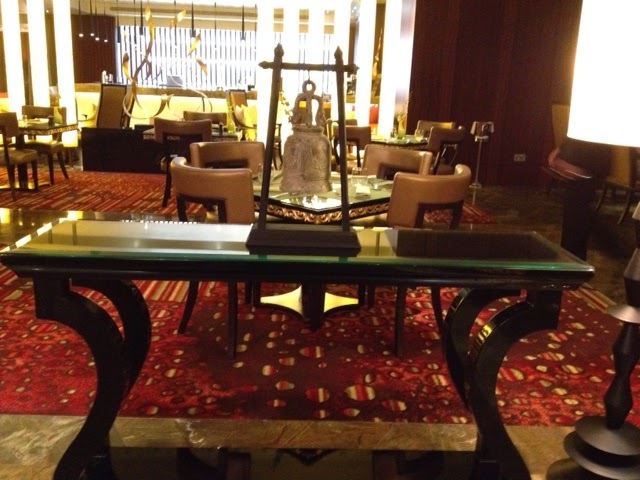 Thai sculptures, easily at home in an art gallery, accentuate the authentic feel of the restaurant. Low key lighting, used to such good effect, brings a contemporary atmosphere to this traditional setting. Focus...I return to my seat and order. It would be a shame to go the usual route of ordering a starter, soup, main and dessert, so instead I ask the chef to prepare small portions of a few starters, aware though that Chef will be compromising on presentation, but I let aesthetics be, and opt for trying to focus my attention on the tasting of his dishes. I go with the classic Thai dish, som tam (green papaya salad), the gai nua satay, a South East Asian favourite, the yam nua (spicy beef salad) and also the yan woon sen thalay (prawn glass noodle salad). While I wait, I am offered a cup of lemongrass based ice tea. It is sweet but refreshing. Lovely. When my starters arrive, I am impressed. While chef was concerned that the small starters would not offer anything exciting by way of presentation, I realise those concerns were unfounded. Chef's innovative presentation because I went with smaller portions. The banana leaf used to good effect. The papaya salad is indeed classic: a bit of bite from the chili, contrasting with the somewhat tart flavour of the papyaya, but all the while the crunch of all the ingredients is there. The satay is simple but tasty; cooked to perfection and complemented well by the peanut sauce. In the spicy beef salad, the grilled beef's natural flavour is juxtaposed with the soy sauce, chili, and bit of sugar, amongst the other ingredients. Could this be the dish that made me fall in love with coriander? Finally, because glass noodles are just so pretty, I knew I would love this dish, and I was not disappointed. I loved that the prawns were not overpowered by the rest of the salad, and furthermore, I loved the surprise which was black mushroom fungus. Totally unexpected, Oh so chewy! 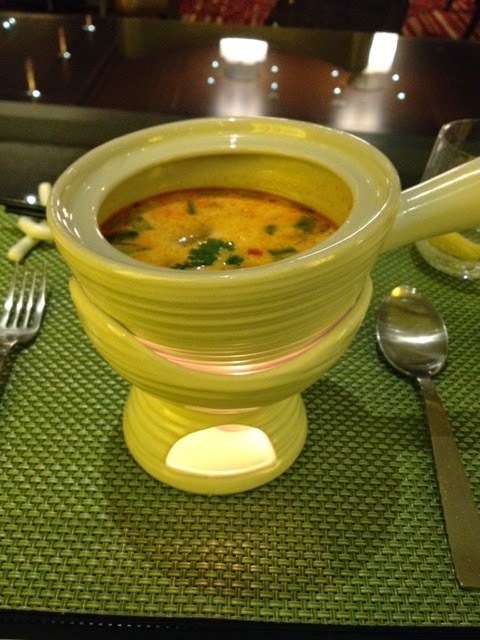 Bridging my starters and mains, I ordered the tom kha gai soup, a spicy and sour cream coconut soup. While in some dishes, the taste often leans towards one or the other, this dish allowed you to appreciate both hot and sour in equal measure! Next, my waitress for the day came and took my order for my main. Again, with no note pad. Wow, I thought. A few minutes earlier I watched her with two other customers as she took some complicated instructions from them regarding their dishes with only the skill of active and attentive listening- we could all learn from her! I am afraid I was very uncreative in my choice of main, but I really wanted a curry, one of my staples on previous visits to the land of smiles. My waitress sensed my uncertainty though, and suggested I try small portions of all the curries. Brilliant. I named this a Tale of four curries. Again, I thought the portions were absolutely spot on - a platter with four curries comprising red, green , panang and massaman curry. 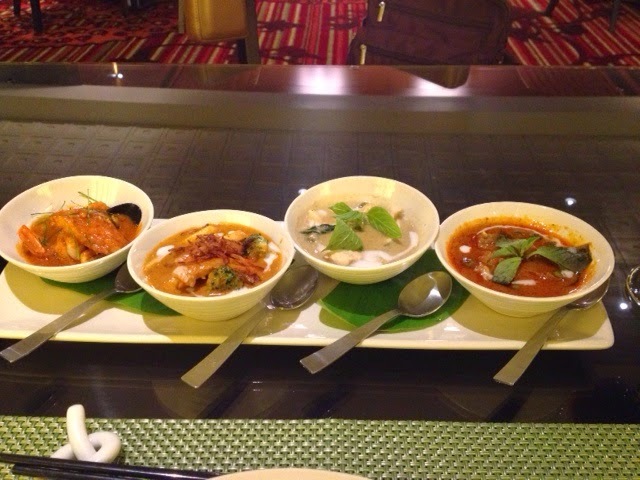 Benjarong allows you to 'create your own' curry, and I choose chicken, beef, seafood and vegetables in that order. So, in the end, could I choose a favourite? An unfair question because each curry had something unique and delicious. 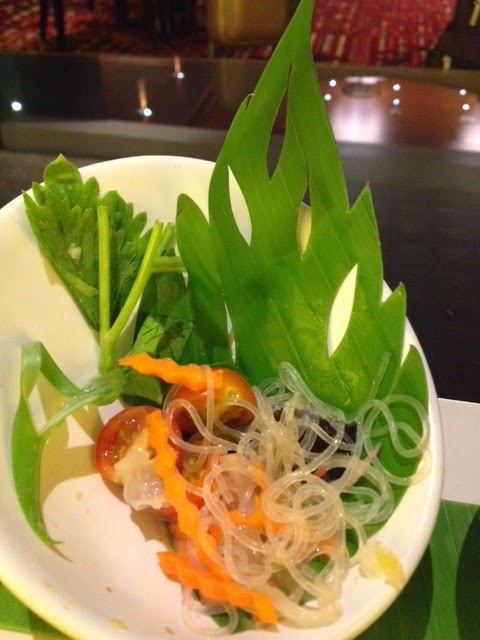 The coriander stood out in the green curry, the red curry had a boldness about it and a hint of sweetness. The seafood in the panang curry was outstanding while I enjoyed the taste of cardamon in the massaman curry. All in all, my tale of four curries was a lovely one. It was flavorful, and at times it took me to the streets of Bangkok. Memorable. 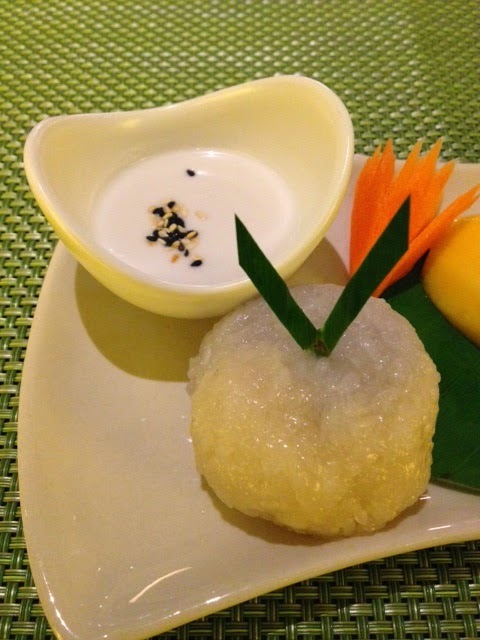 One of the wonderful things that is in abundance in Thailand is fruit, so it was no surprise that I chose the khao niew mamuang (mango and sticky rice ). Just before it was brought though, I was given a damp towel again to refresh. Nice touch indeed! 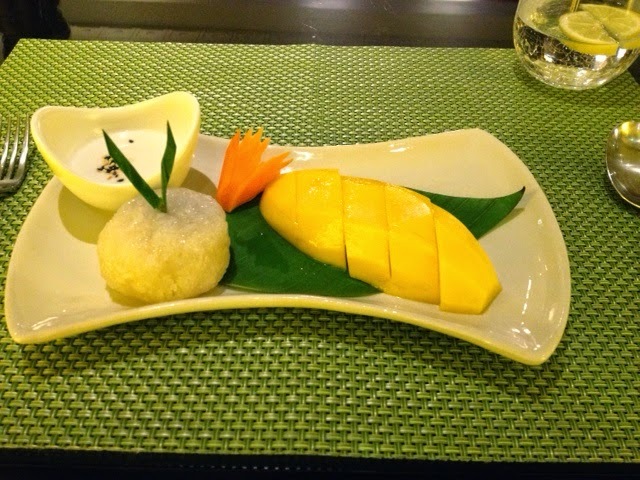 The dessert itself, was a study in contrast: The texture of the sticky rice was against the mango. There was the saltiness of the coconut cream and the super sweetness of the mango. 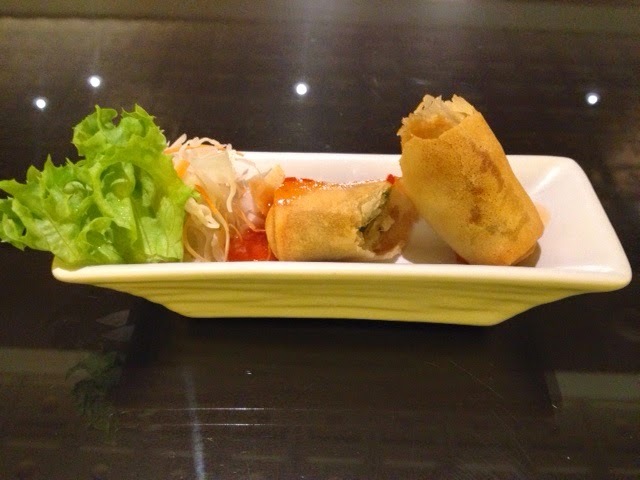 By the way, I am told that if they cannot get Thai mangoes, the they do not offer this dish. I can see why. Those mangoes are integral. Highly recommended dessert. Thus ended not just a meal. For me it was indeed retracing of footsteps; it was a journey that brought me flashing images : tuk tuks, street food, the colour yellow, the reclining Buddha, the Chao Phraya river, ubiquitous 7-11s, the traffic...that is how real my experience at Benjarong was. 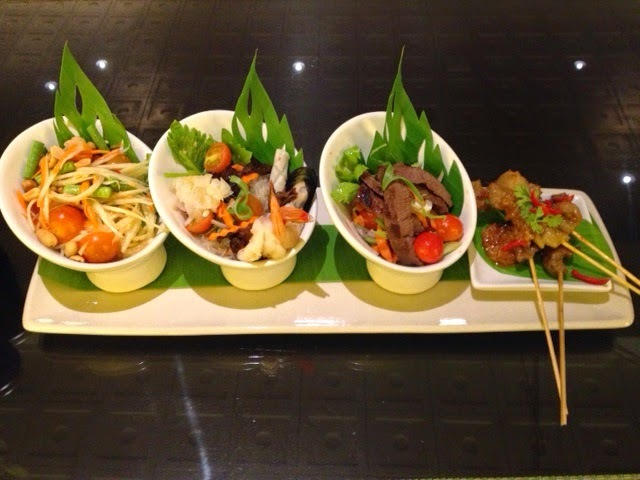 It was alittle piece of Thailand right here in Abu Dhabi, at the Dusit Thani!